Cờ cá ngựa which is also known as Horse Race is a game from Pachisi family of games such as Ludo, Parcheesi etc. This game is popular in South Asia (Vietnam in particular). 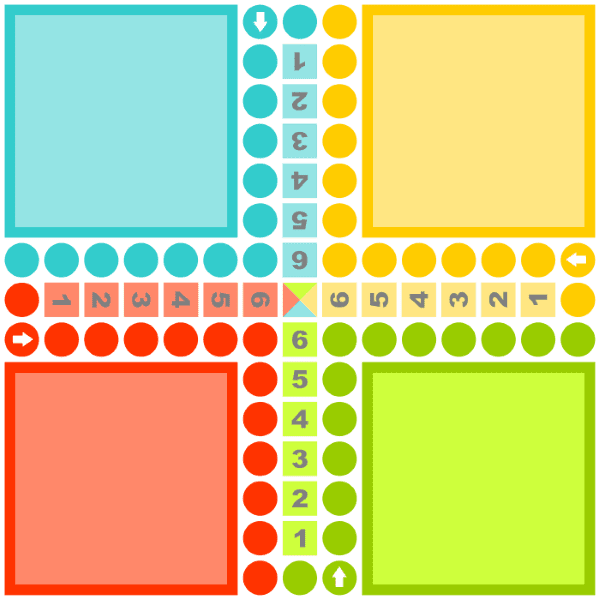 The game is played similar to Ludo or Parcheesi but has its own variations in the rules and game play. It is a pure racing game requiring very little strategy compared to other similar games where certain strategies can be used to block other players from moving. The game can be played by 2 to 4 players. Each player has his/her own starting stable and has 4 horses in the starting stable. Starting stables are colored red, green, yellow and blue which are located at the four corners of the board. The target for each player is to get their horses out from their starting stable and race it to their home stable safely. Home stables have 6 spots and are numbered 1 through 6. The four horses should reach home stables and take 6th, 5th, 4th, and 3rd spot to win. The game can be played by using either one die or two dice. The rules of the game are as following. You need a double (both dice having same number) or, a pair of 1 & 6 to make a horse start the race. You get another chance to roll if a double or a pair of 1 & 6 is rolled. If you are outside the home stable then you are allowed to use sum of both dice to move. Once you have entered home stable then you can move sum of both dice, or a single die, or 1 spot (in case you rolled a double and sum or individual value of dice can not be used to move forward). If you are outside stable and rolled a double then you can use one die to move in case sum of both dice can not be used to move forward. You need either a 1 or a 6 to make a horse start the race. You get another chance to roll if a 1 or a 6 is rolled. One spot can only have one horse at a a time. You can not move past a horse either your own or your opponent's. You can kick your opponent's horse back to its stable if you rolled exactly same number required to reach that spot. There are no safe points for a horse so it can be kicked back to its stable at any point during its race. Though some variations allow the starting spot for a horse to be a safe point, this version of the game does not allow it.